← …When will I learn?? My sister the Chef and her kids have been staying with us for the past few days. 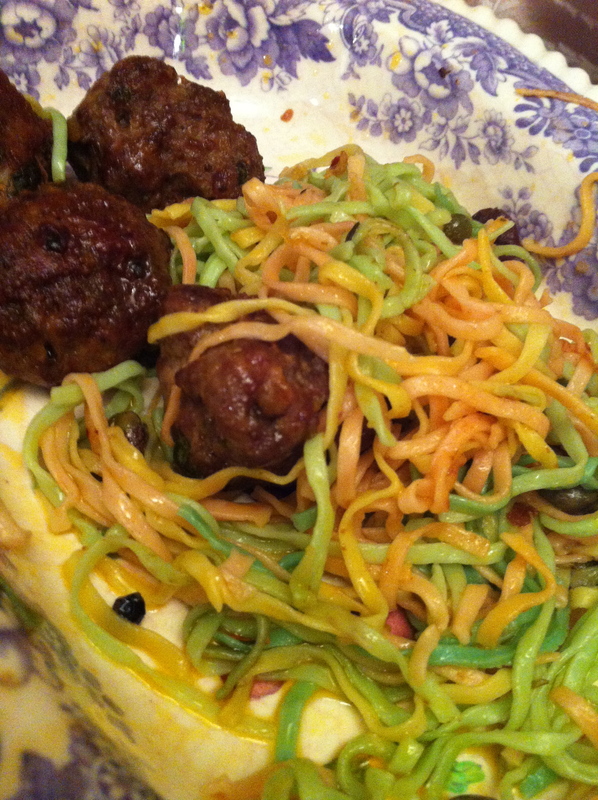 Last night we decided to make Pasta and Meatballs for dinner – and then E suggested we make RAINBOW pasta! After a quick discussion with all parties involved, rainbows were heartily agreed upon. Now, my sister is not a fan of traditional Spaghetti & meatballs, so we decided to make 3/4 of the pasta with a red sauce & meatballs, and the other 1/4 with Garlic Confit *clapping*. Before yesterday I had only ever turned the pasta fun colors AFTER it was cooked. 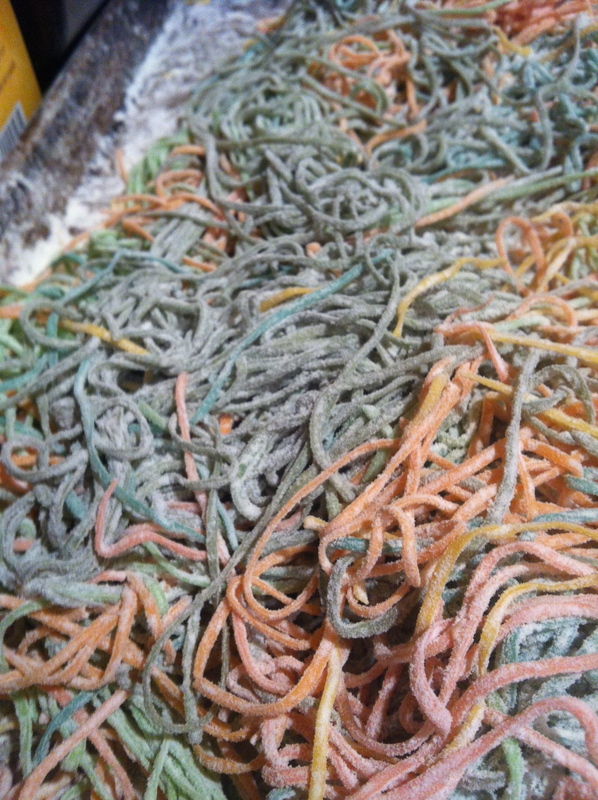 My sister showed us how to dye the pasta AS YOU’RE MAKING IT. That was pretty cool. Crunchy, Cheesy, Toasty, Gooey – YUMMY!!!!! You toast thick slices of bread and you are supposed to top it with slices of ham and then grated cheese, then broil them to melt the cheese. Since we don’t eat ham, I consulted with my sister the Chef about appropriate substitutions – caramelized onions and thyme-roasted mushrooms seemed like good choices. I grated a few ounces of smoked gouda atop the mushrooms & onions. Then you broil that a few minutes til the cheese melts. 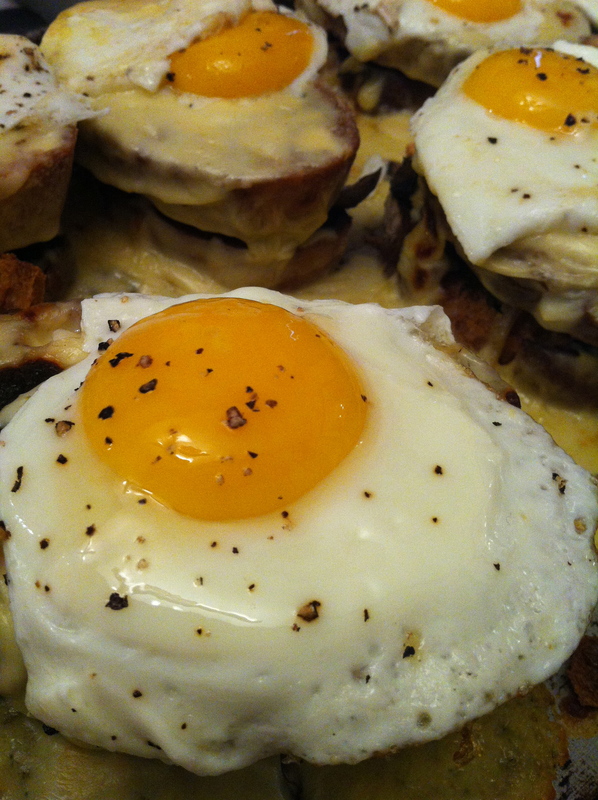 You top that with toast slice #2, ladle some homemade Mornay Sauce (Bechamel + Cheese = Mornay) over the sandwich, broil that until its browned, then top everything with a sunny side up fried egg. a) Toast, mushrooms/onions, grated cheese – broiled. 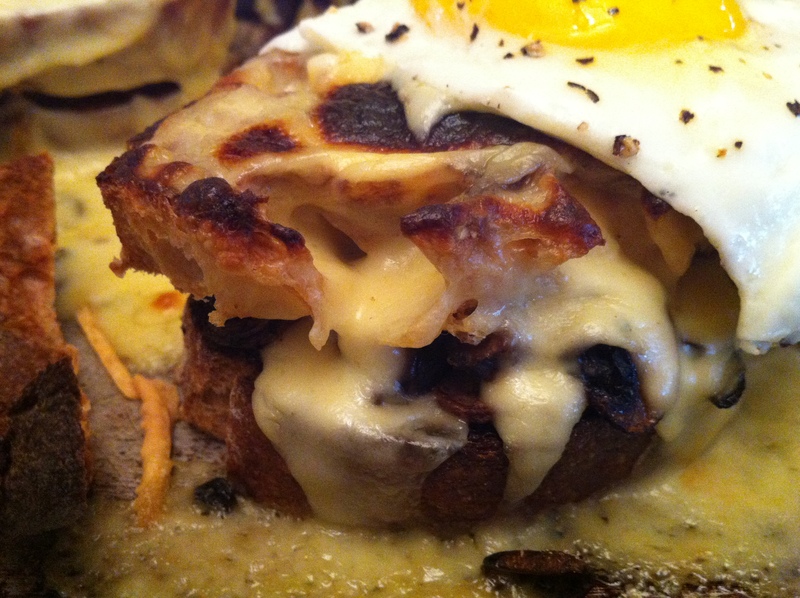 b) Toast #2, Sauce Mornay – broiled. d) Use a fork and sharp knife to enjoy this amazing sandwich. e) Hug yourself and do a little Happy Dance! 1- Gently mix eggs into the flour until you have a big crumbly mess. 2- Knead until the said crumbly mess comes together and becomes a ball with a little stickiness to it but quite firm. Here’s where you add in your food coloring: Decide how many colors you’d like. Divide Pasta dough into that many balls (we used Red, Orange, Yellow, Green, Blue and Tie-Dyed – was supposed to be Purple = 5 balls of dough) and add 6-10 drops of your food coloring to each ball, more if you need it. Knead in the coloring. Don’t stress if the dough looks streaky, when you crank it out it’ll blend in. Promise. Also, the dye will wash off your hands. Eventually. 3- Wrap in plastic wrap for 10+ minutes. 4- Dust well with flour and use your handy-dandy rolling apparatus to get thin pasta – CRUCIAL STEP: You take the first hunk of dough you’re gonna roll out and flatten it into a disc shape. Once you’ve run the disc through your roller on your largest/widest setting, you’ll fold the rolled dough into 3rds and feed it through again, and then repeat the fold & feed 4 more times. THIS is where the color will smooth out throughout your pasta. 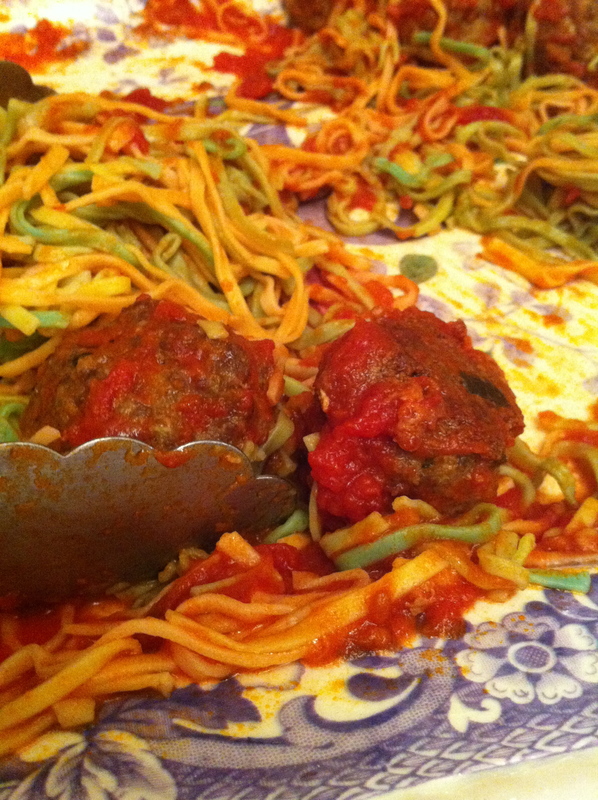 5- Then either use your linguini cutter or your knife/pizza roller to make the strands. Dust all strands with quite a bit more flour so the strands won’t stick to each other. We dumped all colors together into a single baking sheet and made sure we coated all very well with tons o’ flour. 6- Bring large pot of salted water to boil and fresh pasta will only take 3 minutes to complete (dry all uncooked pasta overnight and either store in fridge or freeze). 1- Oven to 375º. Line baking sheet with tin foil. 2- Add all ingredients to a mixing bowl. 3- Mix gently with your hands until everything looks incorporated. 4- Take a walnut sized hunk of meat and roll gently. Set on tray. Repeat with the rest of the meat – makes about 2 dozen, sometimes 3 depending how small you rolls balls. Shpritz the top with some Pam/olive oil so balls get nice color and a little crunch. 5- Bake until done (about 25-35 minutes). 6- Either eat right away or add to whatever sauce you’re serving the meatballs in and allow the flavors to meld (alternatively, allow to cool and then refrigerate or freeze to use another day). 8oz non-dairy cream cheese **I use Tofutti brand. 2- Mix Panko + Garlic Powder + Paprika + Chili Powder. Set aside. 4- Wash and cut Jalapeños in half. De-seed. 5- Scoop non-dairy cream cheese to fill the jalapeño cavity. Set aside all filled peppers. 6- Whip egg white + water. 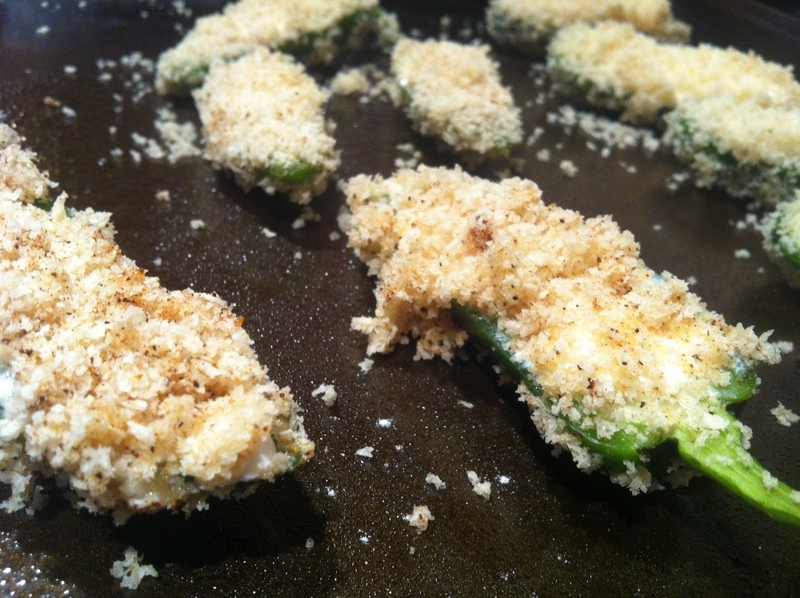 7- Dip jalapeños in egg whites and then panko mixture. 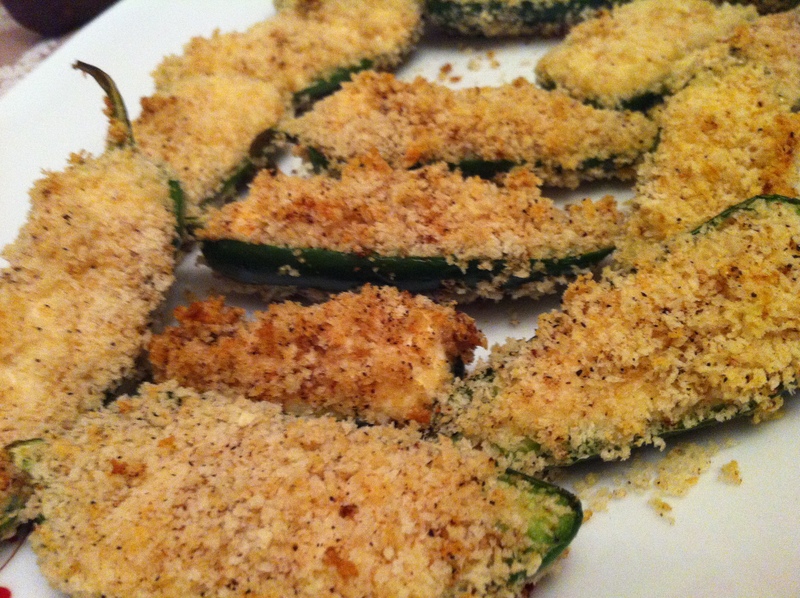 Lay on lined baking sheet, piling additional crumbs atop each jalapeño. Shpritz with a little Pam and whack the pan into the oven for at least 20 minutes – til the cheese starts getting oozy. Serve! 12oz Gruyere Cheese, grated **We used a whole melange of cheeses including an aged provolone and a hunk of Jarlsberg. 12 Thick slices of bread **I took a loaf of day old Ciabatta and sliced it into 16 slices, as we were making 8 sandwiches. Small hunk of Smoked Gouda, grated. Came to about 1/2 a cup. Nothing wrong with a little more though, just in case you have more in your fridge. Cooking for a crowd never tasted so good! 1- Heat 3 tablespoons butter in a 2-quart saucepan over medium-high heat. Add the flour and cook, whisking, until smooth, about 1 minute. Whisk in the milk and bring to a boil. Reduce the heat to medium-low and let simmer until slightly reduced and thickened, 6 to 8 minutes. Add 1/2 cup grated cheese and whisk until smooth. Season with salt, pepper and nutmeg (You just turned your Béchamel into a Mornay Sauce! Taa Daa! You’re now French!). 2- Add 1 teaspoon of Olive Oil to a nonstick pan. Add your onions and shallots and over a low heat, sauté your onions until they’re a rich caramel color and taste a little sweet – this step takes about 20 minutes or more, depending on the size of your onion. The longer you cook them, the sweeter they’ll get. Set aside. 3- My sister the Chef told me to stop rinsing my mushrooms, instead take a damp paper towel and gently brush off the dirt. Then you slice the mushrooms medium-thickly. Add 1 teaspoon of Olive Oil to a large pan. Add your mushrooms and let cook 5-8 minutes until they release their juices. Then add in your thyme and season with a little salt & pepper. Take off heat and set aside. 4- Preheat the broiler. Toast both sides of each bread slice – about 2 minutes/side. As I was making the sandwiches in bulk, I used a single sheet pan and laid out the bread so it could toast all at once – okay. In two batches. That’s what I meant. You’re supposed to spread 1 T of Dijon over each slice of toast. *sigh* I didn’t, therefore I declare it’s an optional ingredient! 5- Remember – there are 2 pieces of toast per sandwich. Set half aside. Take the others and lay back on the baking sheet. Top with onions, then mushrooms, then a pinch of grated Gouda. Shove 1/2 sandwiches under the broiler for a minute or two until the cheese starts melting. 6- Top with the remaining toast slices, and then pour a generous amount of béchamel/Mornay Sauce on top of each sandwich and sprinkle with the remaining grated cheeses. Broil until the cheese sauce is bubbling and evenly browned, 2 to 3 minutes. 7- While the sandwiches are being broiled, melt 2 tablespoons butter in a nonstick skillet over medium heat. **I used a large griddle and did all the eggs at once. ….Ok. Truth be told: my sister the Chef fried all the eggs all by herself. I LOVE HER!! 8- Add 3 eggs, sprinkle with salt and pepper and cook until the whites are cooked but the yolks are still runny. Repeat with the remaining butter and eggs. 9- Add one egg/sandwich and serve to a hungry crowd. 10- You have two options here: a) Stand back and watch all the smiles and hear all the oohs & aahs or b) Dive in Face First and try not to make gobbling noises as you down this sandwich. As my sister says, This was AMAZEBALLS. 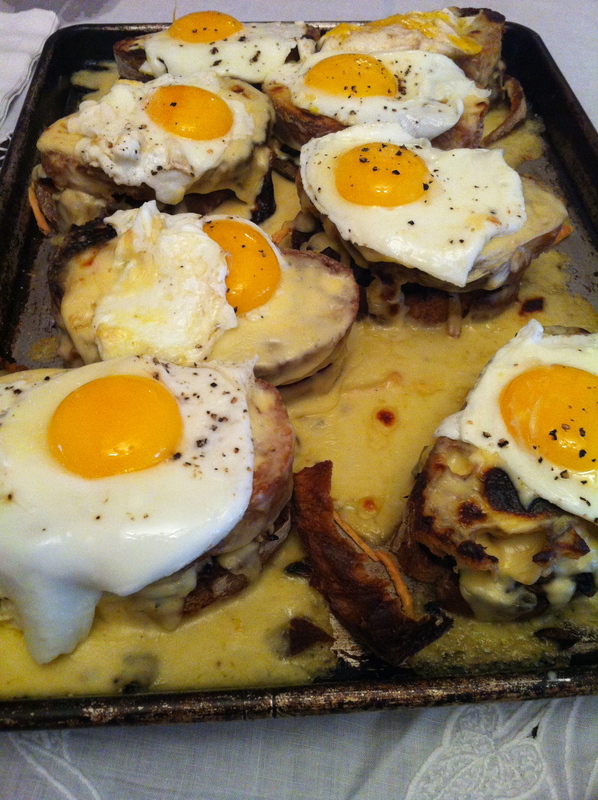 I once posted a no-ham Croque Monsieur on my blog, and someone had issues over it because the ham was omitted. Seems that without the ham I wasn’t “allowed” to call it by that name. *sheesh” Your version of Madame sounds delicious, BTW.